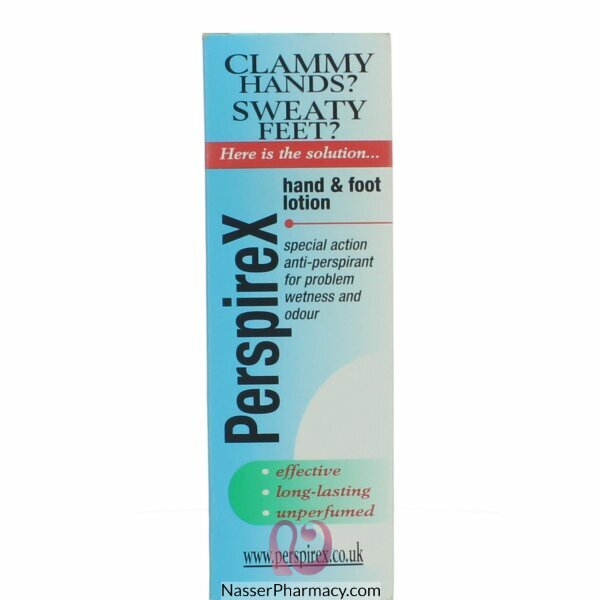 Nice and convenient consistency that absorbs quickly without leaving a greasy feeling.Perspirex Lotion provides unrivalled protection from sweat and odour for your hands and feet. It is considered one of the most effective means of treating problem perspiration in the palms of the hands and the soles of the feet. The active ingredient aluminum chloride, in an alcohol solution, is recognised and proven to be a very effective method of treatment against problem perspiration and odour. Perspirex Lotion is perfume‐free and non‐staining.One application of Perspirex lasts for 3 - 5 days.